~The Simple Sophisticate, episode #221~Subscribe to The Simple Sophisticate: iTunes | Stitcher | iHeartRadio | YouTube | Spotify “The endless challenge no matter where any of us lives is to choose what we take from all that our surroundings have to offer and put it together in a way that creates our own happiness. I am so glad I was willing to […] Listen now or continue reading below. 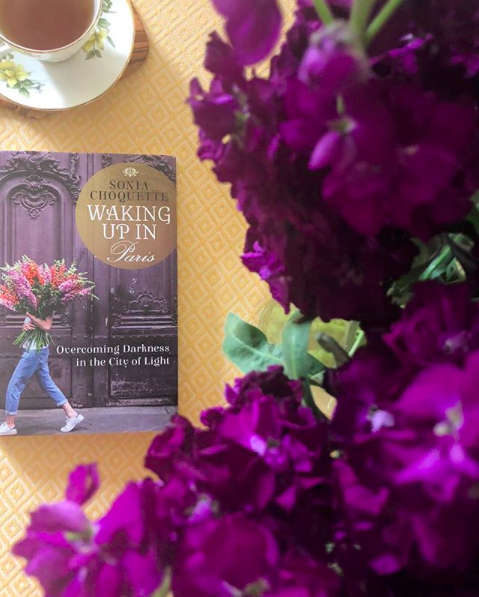 On today’s podcast, author and spiritual teacher of more than 30 years Sonia Choquette joins me to talk about her new memoir Waking Up in Paris: Overcoming Darkness in the City of Light from her home for more than three years, Paris. Diving into what prompted her to move from Chicago to Paris in early 2015, as well as settling into a new community, let alone a new country, Sonia talks honestly about being patient, enjoying her own company, slowing down and the process of reinvention and transformation. ~Update: Episode #222 will air this Saturday with a guest from Paris joining us. Be sure to tune in! ~Learn more about TSLL’s Weekly Newsletter Subscription here. Thank you for tuning in. Yes, Sonia is very open and honest about her journey which is helpful and a reminder that we truly do move through our lives and have “chapters” so to speak. Each chapter is helpful and can be full of love, so if we do move in separate directions down the road, it isn’t something that should make us disparage what we have had. Her self-reflection and awareness is inspiring. This episode woke me up to things I’ve let go of (that want to be reborn) and things I’ve been holding on to that need to be let go. I cried when I listened to it. Can’t wait to pick up this book. Thank you for recommending it. Kate, Thank you for sharing your response to what Sonia shared. I think you will find great comfort, but also great inspiration from her book. I devoured it in a matter of hours early one morning. Sonia is very honest throughout the entire memoir, and reveals to readers that such a journey isn’t always smooth, but absolutely worth it. How does one pick up and move to France? Do you go as an expat? How long is one allowed to stay without citizenship? Just curious how this works. Depending upon how long you are there, you will need to apply for a Visa. Which country you are coming from will determine as well what you need to do. I listened to this podcast with my mouth wide open. I was living in London, England when my world came crashing down. I was married for 27 years and my marriage ended. I took my two girls and did the reverse…I moved back to the US to a new life near the beach. I found that incredibly healing to be in a beautiful city near the ocean…that healed me. I have ordered Sonia’s book and cannot wait to read it….it is my story in reverse….I could relate to everything she said in such a personal way. I, too, have reinvented myself and I couldn’t be HAPPIER with my new life….it is so much better than I ever thought….out of the ashes, the phoenix has risen. Thank you for such a wonderful podcast!! Thank you for introducing us to Sonia and her work. I was running errands yesterday and listening. There’s so much wisdom in the conversation that you had with her that I plan to listen again when I can be still and soak in every word. Will be ordering her book today so that I can sit & steep with it as well. This particular podcast is my favorite that you have shared. Thank you for dedicating your time and energy to enlightening your listeners and readers. Debbie, Thank you for tuning in as you went about your day. I think you will find great inspiration in her book. This is such a beautiful episode! Very poignant, nurturing and reassuring at the same time. I will definitely be re-listening multiple times. THank you Shannon! I agree with you, Ksenija, on the choice of “nurturing” to describe how this podcast resonated with me as well. And, I too will be taking multiple opportunities to re-listen, note take and ponder my own life. In fact, my husband and I agreed we would re-listen together to discuss it. That is a pretty wonderful gift to be able to discuss some deep notions together. Thank you, Shannon for the great interview.